This is good news for DD Freedish viewers who are demanding devotional TV channels, Finally, DD Free dish 40th e-auction result declared and 3 devotional TV channels added on the platform. The 40th e-auction was announced only for devotional channels, as you know recently DD Free dish revised its policy and added "R1 Bucket" to reserve 3 slots for devotional TV channels. 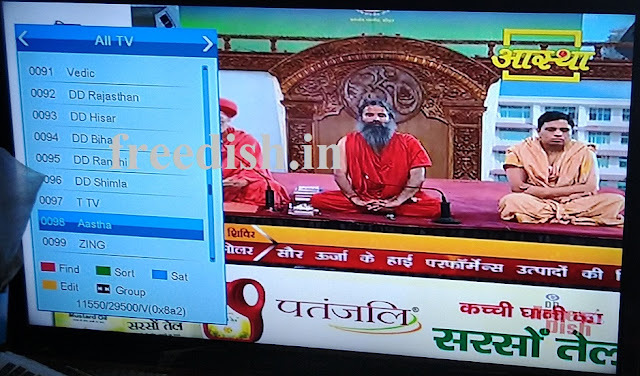 So DD Free dish added 3 devotional TV channels as pro-rata basis from 15 April 2019 to 31 May 2019, including Sanskar TV and Vedic Channel. You should add all FTA channels available (at least in India), that way the number would go 100+ & rural people will be happy to have FreeDish. But for that you should make this auction process easy in way to look it on non-profit basis, in that way the very purpose of FreeDish will be served. Add sony pal ,rishtey, zee anmol, utsav,star bharat etc and carry india beyond to digital india and help to india making good country.